The West Windsor Bicycle and Pedestrian Alliance is organizing its 10th annual Walk to the Farmers’ Market to mark the opening day of the market on May 4, at 9 a.m.
Meet us at Windsor Haven development off Bear Brook Rd at 9 a.m. Our ~ mile-long walk will take us down Windsor Haven and Bear Brook Rds, and then to Alexander Road. We then cross Alexander Road, where we will proceed to the Farmers’ Market and the WWBPA table. Join the West Windsor Bicycle and Pedestrian Alliance in a walk to the Farmers’ Market on opening day, May 3rd, 2014. We start at Maurice Hawk School and stretch our legs while enjoying the scenery on the way. Meeting in front of the school; step off is 9:00; prizes will be raffled to participants at the WWBPA table. This event is free and no pre-registration is required. We will lead a walk back if requested when everyone is ready. Our sixth annual Community Bike Ride (plus walk) is an 8-mile down the D&R Canal to Brearley House and the new Lawrence Hopewell Trail, and back. Come learn about this new 20-mile route! Cyclists meet at 2:15 p.m. at Turning Basin Park parking lot (Alexander Road and the towpath); the ride leaves at 2:30 p.m.
Walkers, meet at Port Mercer parking lot, 4278 Quakerbridge Road, for a 2.5-mile loop, also at 2:15 p.m.
No preregistration is necessary for the ride or walk; if riding, just bring a bike in good working order and a helmet. The ride or walk is free. Children under 13 should be accompanied by an adult. We will adjust routes as needed because of road construction. Check back on our website or Facebook page for final details. This free, family-friendly walk was open to people of all ages, and those in wheelchairs and strollers as well. Our mile-long route took us to Berrien Avenue on the school path, and then down Berrien to Alexander Road. We then crossed Alexander Road by the Arts Center and turned left onto the sidewalk constructed in summer 2011 with the help of a Safe Routes to Transit grant obtained by West Windsor Township. We crossed Wallace Road and continued up over the roundabout and along more of the sidewalk along Alexander Road, including a key portion installed in 2011, to Vaughn Drive, where we turned right and proceeded to the Farmers’ Market. 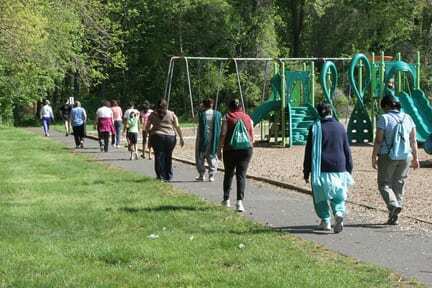 In May 2011 the WWBPA led a walk from Maurice Hawk School to the Farmers’ Market at the Vaughn Drive Parking Lot. About 20 people participated, from grandparents to grandchildren. Our first stop was at the Arts Center on Alexander Road where Greening of West Windsor (GroWW) was holding an Herb Sale to benefit the plantings at the Arts Center. We observed the new sidewalk along Alexander Road from Scott Avenue to Wallace Road under construction, and noted that on next year’s walk we would use it. Crossing Wallace at Alexander instead of at Scott is much safer because cars have a much greater sight line to the pedestrians. We proceeded to the station, under the tracks, and along the pathway to the Farmers’ Market, where the WWBPA handed out maps and held a drawing for a T-shirt, a reflective vest, a set of lights, a set of ankle bands and a couple of Share the Road decals. Everyone had a good time.